I am sure that the Thai dishes I have tried to date are barely a drop in the ocean compared to the authentic and indigenous range available – the bulk of which I have eaten in the UK have been really good. My favourite haunt for Thai food is definitely the Crazy Bear in Stadhampton, Oxfordshire and my very first experience was Chang Mai Kitchen in Oxford some 20+ years ago. I have a fair number of cooking books on Asian and Oriental Food – to be honest (and in a good way) a lot has become quite a blur to me in terms of trying to find something which is 100% Authentic Thai (as opposed to Japanese, Chinese, or simply a fusion of many things Asian/Oriental) – a Green Thai curry should hopefully put a check in the box. This recipe is an amalgamation of a few Thai Green curries I have read – and inspiration comes from The Hairy Biker’s Asian Adventure (sadly, I do not have an oversized pestle and mortar), a Jamie Oliver blog recipe, and Bill Granger. 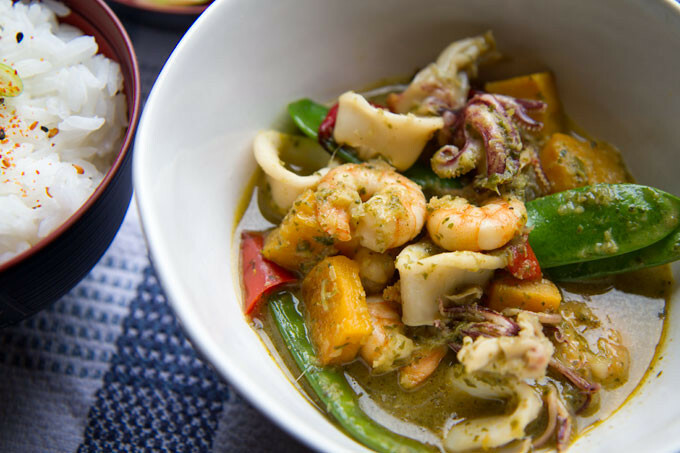 I really hope that this Thai green curry with prawn, squid, and butternut squash hits the spot – it certain does for me. A home-made green Thai curry paste beats everything you can buy in a jar, I promise you. This may look like a lot of work as there are many ingredients in the mix, however if you plan correctly it is not as daunting as it may first appear. Prepare all your ingredients in advance, and line them up as you need them. Rather than tackling this all at once, you could roast the veg and make the Green Curry paste a day or two before hand. First, you'll need to roast the red bell peppers and butternut squash. Pre-heat the oven to 200C. Line an oven proof tray with tin foil, drizzle a little olive oil, and put on a top rack in the oven to heat up. Meanwhile, slice the peppers into bite size pieces and place it in a mixing bowl. Then, cut what you need from a butternut squash, peel the outer skin, and cut into cubes Add to the red peppers, drizzle 1 tbsp olive oil over, season with sea salt and fresh ground pepper and mix well. When the oven has reached temperature, remove the tray add the pepper/ butternut squash combination, even out on the tray and roast for 30-35 mins, or until starting to golden. It is worth turning over half way with tongs to ensure everything is evenly cooked. Once cooked, remove from oven and allow to cool. Whilst the vegetables are roasting, prepare the Thai green curry paste. In a mini chopping bowl or food processor, combine the coriander seed, lemongrass and kaffir lime leaves and blitz. Then, add the chilli, garlic, ginger, lime zest and blitz again. Next, add the coriander stalks, spring onions, soy sauce and fish sauce and blitz again. Finally, add the coriander leaves and blitz until the texture is a paste. Step 3 - Make the curry. Heat up the groudnut oil in a large wok on a medium to high heat, then add the curry paste. and warm through. Then, add the baby corn and red chilli, and stir-fry for 2 minutes. Spoon in the roasted butternut squash and bell peppers, and warm through. Next, pour in the vegetable stock, and as it comes to the boil add the prawn and squid, and stir-fry all the ingredients for a further 2 x minutes until the prawns and squid change colour. Pour in the coconut milk, gently bring to the boil and turn down and simmer gently for about 10 minutes. minutes before serving, add the mangetout peas and cook through. Garnish with coriander leaves and a wedge of lime, and serve with jasmine rice. This recipe works equally well will chicken.Substitute the seafood with bite-sized cubes of chicken breast. However, add the chicken at the very beginning of the process, once the flavours of the green Thai curry paste have been released into the groundnut oil. Finally, as a further variation, why not add a handful of lychees towards the end to add a sweet addition to the curry? Make sure you remove the lychee stones first. A delicious recipe. Lots of flavours.